From the cool, crisp air, to the beautiful sunsets to the wonderful hues of the changing trees, fall is by far my favorite season. Every year, my family always goes apple picking. It's now mid-September and I'm eager to get back to the tradition of picking apples. Usually, my mom would pick a bucket full while my dad carries it a few feet, takes a break and taste tests. My husband does the same thing, sampling each variety as we move through the orchard giving him the inevitable stomach ache later. We haven't made it to the orchard yet, but I was already craving apples, especially those that you can only get in the fall in New Jersey. Costco used to sell Bare Apple Chips in a family size bag and I would stock up on those and eat those nonstop. This time around, I decided to make them myself. So easy and only a few ingredients. This is a great homemade snack and a great way to use up any leftover apples if you haven't gotten to making that apple pie yet. A zero waste snack too as there is no packaging involved. And it makes your house smell wonderful. Get ready for fall! This posts contains affiliate links. See Disclosure for full details. 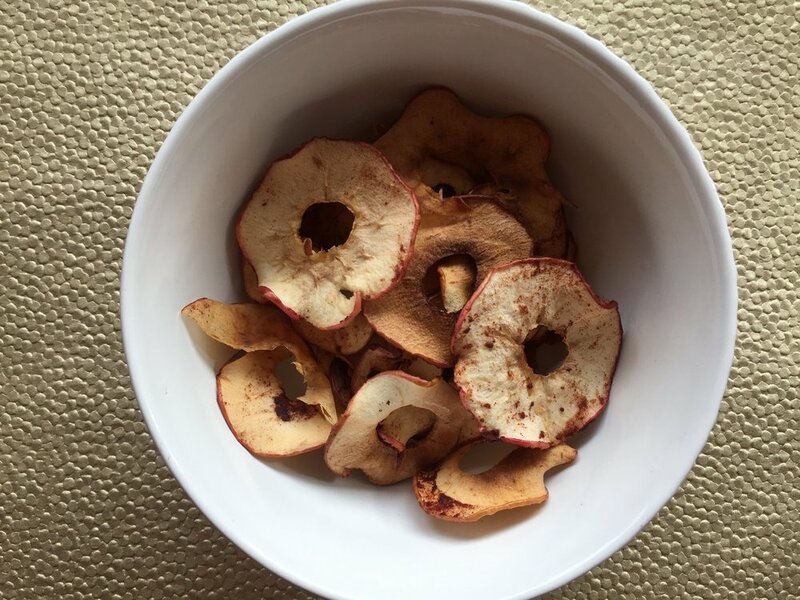 3 ingredient baked cinnamon apple chips. An easy, whole30, paleo and zero waste snack. AND, it makes your home smell wonderful! Slice the apples into thin slices. I use a corer and a mandolin to get them into even pieces. Mix the apples, coconut oil and cinnamon in one large bowl. Don't worry if not all of the slices are coated. Place them all flat on a cookie sheet. Bake for around 1 hour at 300 degrees. Note when the pieces have curled up a little bit. Bake more if you want extra crispy, but this should provide a mix of crispy and soft pieces. Sliced apples coated in coconut oil and cinnamon. Sliced apples post baking. Note how they curl up.